Conceptually, one of the hottest and the most talked about car from Audi, RS 7 may be seen in the Indian market by the second half of the next year. Company’s India Head, Michael Perschke confirmed this during the recent launch of its low cost vehicle Audi Q3. He further indicated that the company is examining all the possibilities carefully before launching the car and it will be rolled out at an appropriate moment.Looking at its global price, it seems that the The car will fall in Rs 65-78 Lakhs price bracket and will be targeted towards the high end luxury buyers. Its distinguished features are gaping air intakes, a honeycomb grille, aluminum-look mirror caps, and the trademark twin oval exhaust outlets. There are some more features which put it one step ahead of its other family members. These are the standard 20-inch aluminum wheels, and the optional 21-inch wheels. Moreover, matte-aluminum and carbon-fiber appearance packages can also be availed. Both of these choices have got large Quattro lettering which are placed low down on the grille, inside a sub-grille that features even-finer honeycomb detailing. The carbon-fiber package also has a modified front splitter and rear diffuser, both of which are done in the light-and-expensive fibers. Hence, a lot to expect when the car comes to India. At the same time, the company has re-iterated its commitment to roll out the next generation Q7 in India by early next year. This one rides on the Volkswagen Group’s third-generation SUV platform and has aluminum based body. Hence, it is lighter by about 5300 pounds as compared to its predecessor. 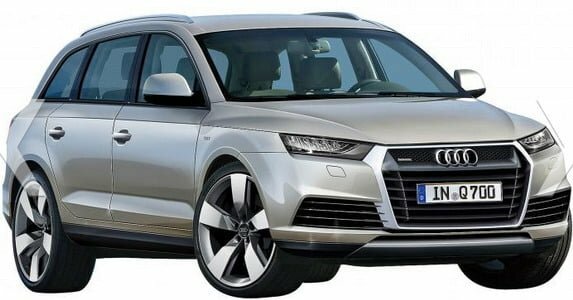 Moreover, the company is also expected to come up with a goodbye version of the past generation Audi Q7 before the gen-next Q7 comes up. Of course, Audi’s elegant interior designing is expected to part of both the vehicles. Audi is the number 1 luxury car manufacturer in India for the time being and with the next generation versions of these two cars coming in next year, the lead is bound to increase over its German compatriots.